Molnár-Institute for Applied Chromatography was founded in 1981. Its world renowned HPLC modelling software DryLab® combines over 30 years of HPLC expertise with the latest software technologies, offering state-of-the -art modelling packages for method development, optimization, trouble shooting, robustness testing and training. With its comprehensive resolution and robustness mapping abilities, DryLab® also ensures inspection safety by allowing users to easily conform to Quality by Design (QbD) standards. By modelling parameter dependent peak movements (with 99.9% accuracy) DryLab® enables users to easily determine the tolerance thresholds that define method robustness. Furthermore, because adjustments within the Design Space are not considered to be “changes,” users can make small modifications in their method without the need for a new validation. 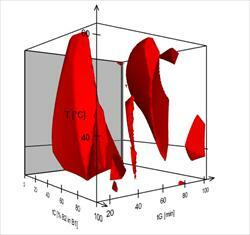 The 3D Module elaborates a 3-dimensional resolution space containing over 1,000,000 precise virtual chromatograms. It allows for the 3D visualization of robust HPLC conditions (depicted by colour) within a cube bounded by gradient time, temperature, and pH or ternary eluent composition parameters. 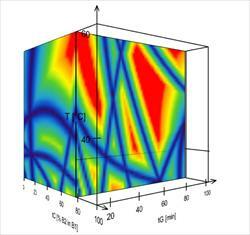 By further varying up to 8 additional method parameters (such as gradient, flow rate, column dimensions, etc.) the 3D cube provides an excellent way to satisfy the demands for Design Space, which requires a simultaneous variation of all influential factors. The new Robustness Module computes the probability of small fluctuations in the values of your working point adversely affecting the critical resolution of your separation. By assessing up to six method conditions at values slightly above and below the set point, the Robustness Module generates up to 36 (= 729) runs around your working point, providing you with the percentage of nearby experiments that maintain your critical resolution. These calculations take only a minute, and based on the outcomes, the set point can be changed to get statistically safer results immediately. Our courses teach basic principles and technologies for the development of robust and transferable HPLC methods, with the help of our DryLab®4 software. Topics covered include the development of new methods, adjustment of old ones, improvement of problem cases and the reduction of run time while preserving the desired selectivity. We also offer a course in Quality by Design (QbD) for HPLC, using DryLab®4 to support this modern approach to HPLC method development.